The Tigers' offensive production during the first half of the season was misleading. Victor Martinez, Ian Kinsler, Rajai Davis and J.D. Martinez were among the veteran Tigers' players, who greatly outhit their track records. Anybody surprised shortstop Eugenio Suarez has tailed off? Or third baseman Nick Castellanos has struggled? They are rookies in their early 20s. Tigers' manager Brad Aumus, like his predecessor Jim Leyland, likes Don Kelly's versatility. General manager Dave Dombrowski, after the trade deadline passed, said he likes Andrew Romine's defense. Yet, neither player adds anything offensively. There is also the matter of Miguel Cabrera. He is not the same hitter after his injuries last year. His numbers are terrific compared to most players, but this is his worst season since or '08, or his second year in '04, depending on how you view the stats. Being healthy enough to play after major surgery is different than being fully recovered. Torii Hunter still does have power. The Tigers missed it the last couple games. Austin Jackson was wildly inconsistent, but he was an offensive catalyst when right. It wasn't like David Price didn't come for an immediate offensive cost. Jackson was hitting well at the time of the trade. Major League Baseball overall is offensively challenged. It's a different era. Certainly, the Royals, hot on the Tigers' tail in the AL Central, are no better offensively. But it is fair to suggest Dombrowski miscalculated by not addressing the Tigers' issues offensively based on a first half that was deceptive. You know that great pitching defeats great hitting - and the Tigers do have both, when compared to their chief rivals in the AL. Getting the hitting to turn on when needed has been the Tigers Ruebic cube for the last 8 years - and knowing the player you want and actually getting them are two different fates. 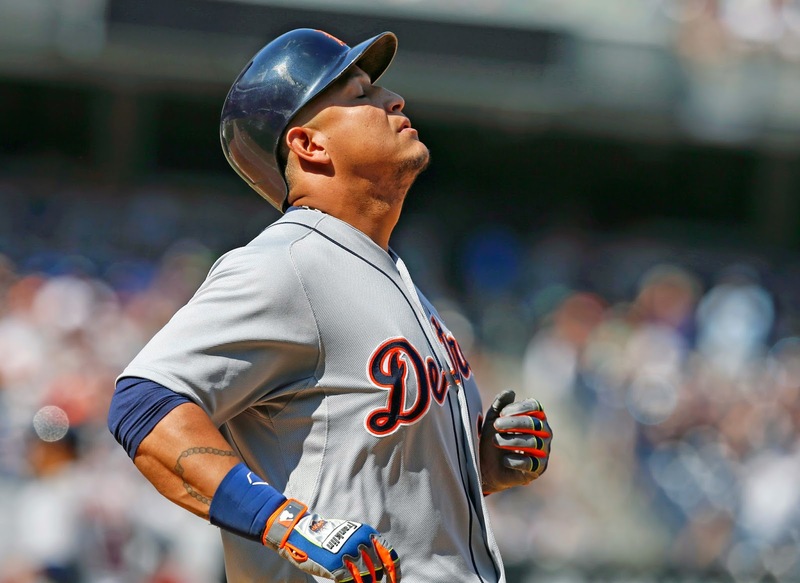 As for Miggy "struggling" this year - only when you compare him to ... Miggy. He may not win 3 MVPs in a row or 4 AL batting titles in a row - but like Verlander - you can only remain truly the best there is for so long. Adding more bats right now is the last thing this team needs. But we all do miss Austin. Jackson.